2014 had some interesting fashion trends. Some were new, some were rolled over from 2013 but the truth of the matter is, they need to stay in 2014!! We are a little over 2 weeks into the new year and I have to say, I’m not seeing to much new style floating around. It’s time to do a closet purge.. and I’m not just talking about the ladies, the fellas can benefit from a good fashion cleansing as well!!! Its time to talk about what not to wear. Now I won’t take up to much of your time, but I do want to address a few things that need to be pulled from your closet/drawers immediately! Ok Ladies.. Here we go. Leggings – I’m on the fence about this one because I am a huge fan of leggings. They are comfortable, quick, and of course cheap. 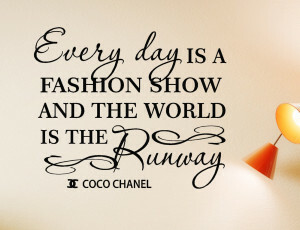 But ladies, we DO NOT have to wear them every day! Now I’m not saying that you should toss all of the leggings, but they should not be your go to pants for every occasion!! And for Heaven’s sake, please do not wear leggings with crosses on them to the club… Not cute. Bodycon Dresses w/splits – I did a post on Formal Vs. Non-Formal during the holidays because a debate came up in a FB group that I am in about this particular “dress.” So I’ll just reiterate a few of the points I made. First of all, it’s not a dress at all. It’s a tunic and is meant to have something worn underneath which leads me to my next point. The boy shorts that are worn underneath..let’s just stop it. Spring is right around the corner, time to trade that in for something different like a cute sun dress! 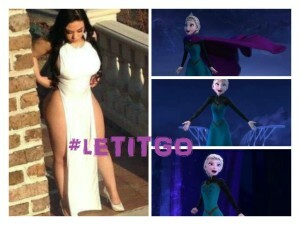 Go ahead girl… let it go. Knee High Gladiator Sandals – Ok, they are stylish and cute I will admit that, but where is the originality? How many times did you go somewhere last summer and see the same style of sandal on another woman? Gladiator sandals are cute but this year, keep them short and different! Bold Colorful Patterned Shirts – It’s a fine line between trendsetter and clown and these types of shirts literally walk that line. If you must wear a bright shirt, there is nothing wrong with it being a solid or having a slight pattern. If you must have a shirt with a pattern, there is nothing wrong with having it in neutral colors or colors that aren’t so bright. 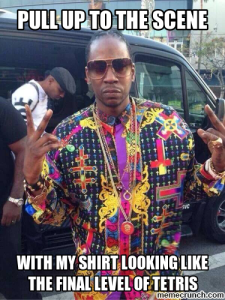 And I know you are thinking “Well, 2 Chainz got away with it.” Actually he didn’t. 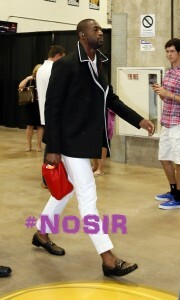 Manpri’s (Capri pants for men) – My blank stare was epic when I first saw a picture of Dwyane Wade in “manpris”. To add insult to injury, my 15 year old told me that he wanted to wear a pair to homecoming. I’m sorry… what??? This is just one of those things that you just don’t do. I don’t even have a substitute suggestion on this one and that’s bad because I always have suggestions. Unless you are wearing shorts, keep your ankles to yourself. Jeggings for Men – So Jeggings are pretty much leggings in a stretchy jean material. It seems that since skinny jeans came back on the scene they have gotten tighter and tighter. I don’t think you guys understand that those tight pants are not good for… some of your body parts (Rated G). I suggest purchasing jeans that are not so skinny and that don’t look like leggings!!! That’s all I have for you there! So now that you have purge your closet, time to replenish it. It’s a new year, a new you so take some time and create a new style. Don’t be afraid to step out of your comfort zone to tweak your style a bit. Previous article	Build your Legacy like Dr. Martin Luther King, Jr. Formal vs Non Formal: Stealing the spotlight at the ball! !